“Handful of Purpose” from Christian Faith Publishing author Sarah Hale is a heartwarming tale that delves into the heart of living a profound life through faith and compassion. “Handful of Purpose”: a stirring story about two individuals struggling to find direction with their lives. 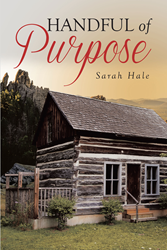 “Handful of Purpose” is the creation of published author, Sarah Hale, a staff development coordinator and nurse educator born and raised in rural Central Indiana, with a strong dedication to following the will of the Lord. Published by Christian Faith Publishing, Sarah Hale’s new book provides a deep reflection in discovering the wonders of life and what lessons it has to offer. Maggie and Thad are two people brought together by a circumstance, and with Maggie’s resolve in trying to build independence and Thad’s current predicament leaves him half-dead, both are drawn to each other’s dilemma of finding the ultimate meaning and purpose of their lives. Can Thad help Maggie find the purpose lacking in her life? Can Maggie provide the means for Thad to fulfill his purpose? View a synopsis of “Handful of Purpose” on YouTube. Consumers can purchase “Handful of Purpose” at traditional brick & mortar bookstores, or online at Amazon.com, Apple iTunes store, Kobo, or Barnes and Noble. For additional information or inquiries about “Handful of Purpose”, contact the Christian Faith Publishing media department at 866-554-0919.